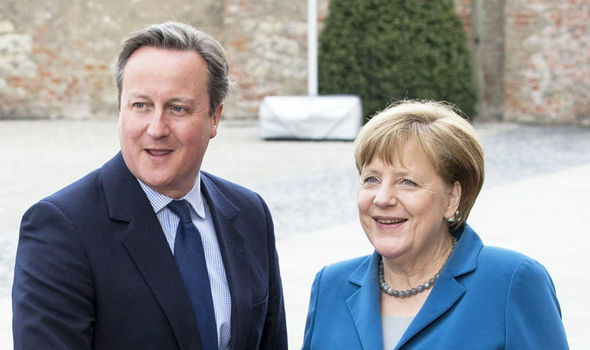 (May 16th, 2016) The (London) Daily Mail calls the disclosure that British Prime Minister David Cameron bowed to German Chancellor Angela Merkel’s demand to drop his European Union membership renegotiation “red line” demanding stronger immigration controls for the E.U., now being flooded with immigrants from the Mideast and North Africa, “explosive’’. “At the time there were a number of Tory MPs who expressed their anger. They knew that without such a plan to halt immigration, even for a while, any renegotiation, however well meant, was fundamentally pointless. Now we know for certain that the renegotiation was not even well meant. It was a sham from the start,’’ the paper asserted. The Boston Global Forum last year named Chancellor Merkel a “World Leader for Peace, Security and Development’’.